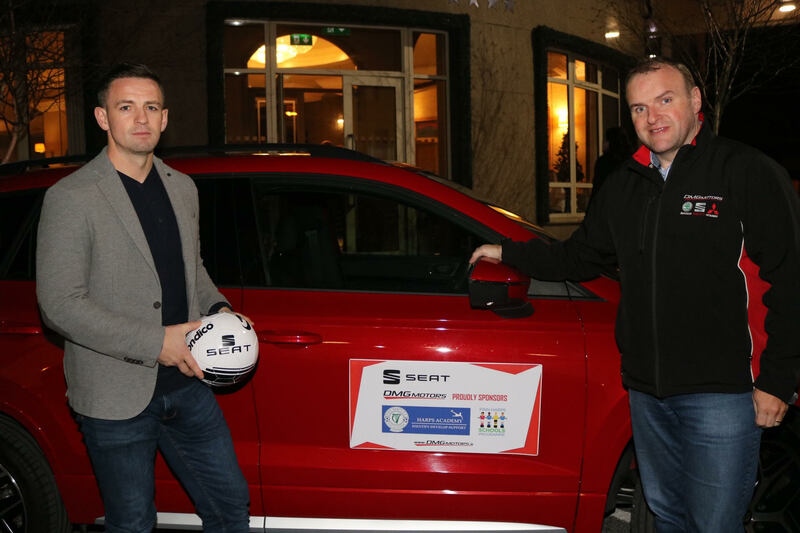 DMG Motors in Donegal Town and SEAT have teamed up with Finn Harps and are the new sponsors of the club’s Academy and Schools Programme. The announcement is the perfect boost to Harps who continue to enjoy fantastic growth at schools and underage level. For DMG Motors, the deal allows them to play their part in the successful underage programme at Finn Harps. It’s a winning combination for all concerned! The new sponsorship deal was announced at the Finn Harps end of season awards event last Saturday night. The new SEAT Ateca was on display outside Ballybofey’s Villa Rose Hotel where a large crowd enjoyed the presentation night. Former Finn Harps striker Kevin McHugh is Head of the Finn Harps Academy and he said having DMG Motors and SEAT on board is fantastic news for the club. “We are absolutely delighted that a forward-thinking local business like DMG Motors has backed our project,” he said. “There are so many positives within our club at the moment and especially our Academy and schools project which is unique on so many fronts nationally. “We have boys and girls, coaches, volunteers and staff from Malin Head to Kilcar involved in our Academy and schools projects so it really is a county-wide project. The sponsorship deal kicked off a week in which DMG Motors are hosting a SEAT Six Day Sales event. The sale runs through until Saturday, November 24 and it’s the perfect time to think about ordering a new SEAT. This week, your 191 Ateca is exclusing available with scrappage of up to €3,000, finance from 1.9%, a free SE Product Pack and free 3-year service plan. You can book your test drive this week to avail of the exclusive sale for 191 cars. The award-winning Arona, Irish Small Crossover of the year 2019, the Ibiza, the sporty Leon, and the award winning Ateca SUV are all available today with incredible offers. Call DMG Motors on 074-9721396 for more details.